Background: The anti-neutrophil cytoplasmic antibody (ANCA)-associated vasculitis are a heterogeneous group of autoimmune diseases that predominantly affects small vessels. Churg Strauss Syndrom (CSS), Wegener's Granulomatosis (WG) and Microscopic polyangiitis (MPA) are the three clinical entities associated to this group. Marked eosinophilia, pulmonary involvement associated with dense eosinophilic infiltration in tissue biopsy and increase of circulating IgE were considered the clinical hallmark of CSS. On a cellular level, a strong shift towards a Th2-like response with massive T cell activation is prominent. CCL17/thymus and activation-regulated chemokine (TARC) is a chemokine responsible for the recruitment of Th2 cells. Objective: Taking into consideration the ability of TARC to recruit and modulate the trafficking of Th2 cellular elements we hypothesized that TARC plays an essential role in the pathogenesis of this disease and we investigated the role of TARC as potential biomarker. Methods: TARC levels in serum from patients with active or remitted CSS, hypereosinophilic syndrome, other ANCA associated vasculitis other than CSS, and healthy controls were determined by enzyme-linked immunosorbent assay. Results: We demonstrated that TARC concentration in active CSS was significantly higher than the healthy control groups and patients with inactive disease. This concentration reflected the clinical disease course and was correlated with the absolute eosinophilic count as well as IgE and CRP levels. 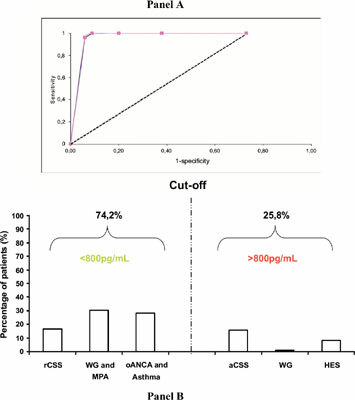 ROC curve analysis was used to determine the best cut-off point (800 pg/mL) with a good sensitivity and specificity. Elevated TARC levels were also noted in patients with hypereosinophilic syndrome but not in other ANCA associated disease and other diseases under exam. Conclusions: TARC could be considered a good candidate as CSS biomarker, because of its specificity and the direct correlation with disease activity. Although the role of TARC in CSS pathophysiology is not yet entirely clear, future studies are needed to understand the effective roles and the possible uses of TARC as a biomarker. ANCA associated vasculitis, anti-neutrophil cytoplasmic antibody, biomarker, Churg Strauss syndrom, microscopic polyangiitis, TARC, wegener's granulomatosis.